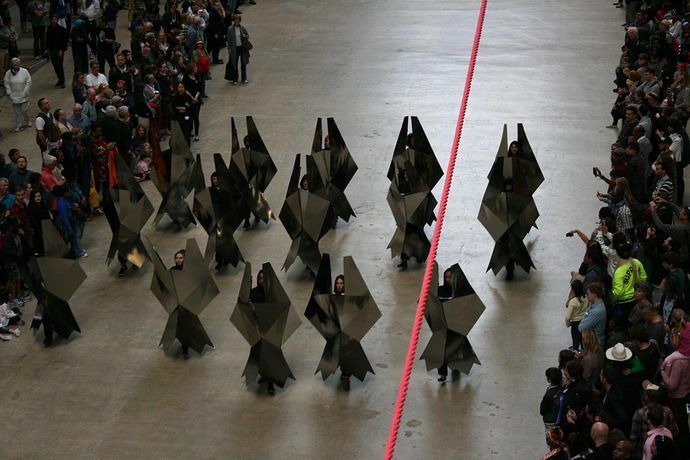 Curating Carnival is a procession, sound and performance event that will take place in The Street in Central St Martins on Friday 30th January 2015. The Curating Carnival event at CSM continues student engagement with carnival from the Tate event by investigating carnival as an artistic practice in the broadest sense: exploring public procession, the carnivalesque, performance, the politics of the street and publicness, resistance and celebration. The event will feature performances, mobile sculptures, projections and sounds from a wide range of students across several courses at UAL, including Fine Art and Performance Design and Practice. This project was instigated and is led by UAL’s joint Chairs of Black Art and Design, Professors Sonia Boyce and Paul Goodwin in collaboration with Senior Lecturer Anne Eggebert and Pathway Leader Stephen Carter of the BA Fine Art XD Pathway at CSM with choreographical coordination by artist Serena Korda and sound design by artists Dubmorphology (Trevor Mathison and Gary Stewart).